Except for white cheese that's used to stuff zucchini halves, this recipe doesn't seem very Turkish or very authentic Turkish. However, I've never had this dish anywhere other than in Turkey. My mom and I usually had this kind of zucchini and baked zucchini as light summer lunches, yet I have seen it served to impress guests at parties numerous times. -Wash zucchinis and boil them until tender but firm. Let cool down. -Cut them in halves lengthwise to make boats. Scoop out the seedy part and save half of it to use for stuffing. 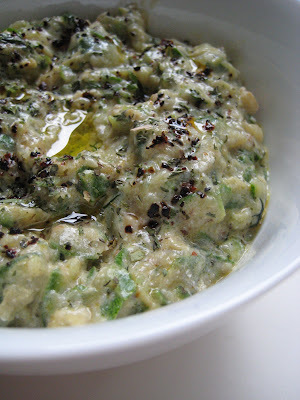 -In a bowl, mix egg, feta, mozzarella or cheddar, dill parsley, black pepper, and half of the seedy part of zucchinis until creamy. 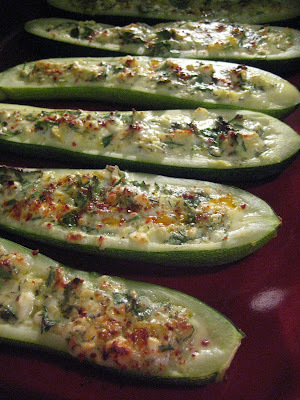 -Load zucchini boats with the stuffing. -Sprinkle a couple of drops of olive oil and red pepper flakes on each. -Bake in a preheated oven at 350F for 10 to 15 minutes until cheese melts. Then broil for a couple of minutes to have a crispy top. Ooh... looks tasty! Definitely adding this to my "recipes-to-try" list! I agree, this looks fabulous. Must try! I'm bookmarking to try this during zucchini season -- you can never have too many great zucchini recipes waiting for the glut of zucchini from the garden in mid-summer! Rather than Greeks and Turks arguing about what originated where, I think the main focus should be about what our two peoples are eating and sharing that. The dish looks wonderful, sounds delicious, politics be damned. 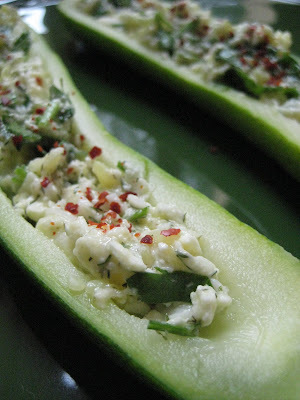 I agree with Lydia: you can never have too many zucchini recipes and this looks great. Turkey origin or not, it is just wonderful! Thank you for providing the recipe. My Turkish grandmother introduced me to this dish as a child.